Care for clothing quickly with this 7.5 cu. ft. GE front load electric dryer. Ten drying cycles and four heat levels let you tailor settings to specific fabrics, and internal sensors automatically adapt the cycle to the moisture level inside the stainless steel drum. This 27-inch GE front load electric dryer has steam settings for fast wrinkle removal. If you live in an apartment or studio, you'll appreciate this GE GUD24ESMMWW electric stacked laundry pair. It's a great choice for a washer-dryer combo that's designed to work together and fit in smaller spaces. With a 2.6 cu. ft. washer, you can wash then dry your full load knowing it'll fit just right in the matching 4.4 cu. ft. dryer. Turn laundry day into a less tedious task and literally save energy with the GE 5.2 cu. ft. ENERGY STAR certified front load washer. This efficient machine is equipped with cycle options and optimized settings to effectively clean your clothes. The steam function penetrates fabrics to help loosen difficult stains The front load design is great for stacking to save space. Easy In. Easy Out. Introducing a new way to do laundry... your way! Choose to open the door hamper style to load wet clothes or swing the door to the side for unloading dry clothes. Equipped with TrueSteam(TM) technology, the SteamSanitary cycle allows you to safely sanitize throw pillows, toys and other delicates with the touch of a button. 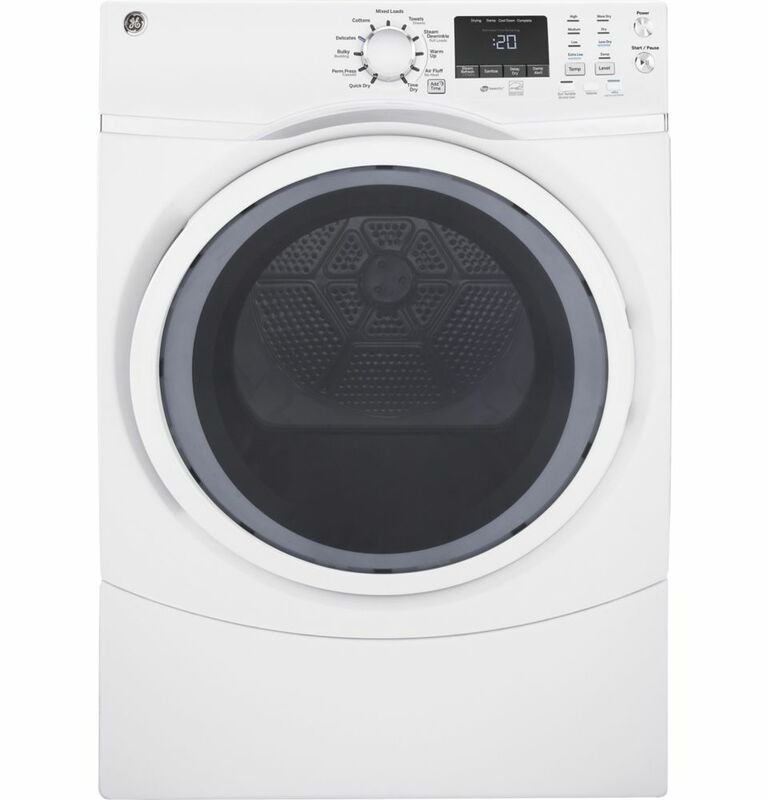 7.5 cu.ft capacity frontload electric dryer - white - ENERGY STAR® Care for clothing quickly with this 7.5 cu. ft. GE front load electric dryer. Ten drying cycles and four heat levels let you tailor settings to specific fabrics, and internal sensors automatically adapt the cycle to the moisture level inside the stainless steel drum. This 27-inch GE front load electric dryer has steam settings for fast wrinkle removal.